“Our whole strength rests on the validity of that vision. It either occurred or it did not occur. If it did not, then this work is a fraud…upon that unique and wonderful experience stands the validity of this church” (“The Marvelous Foundation of our Faith,” Ensign (Conference Edition), November 2002, p.80). 1) He can insist that Joseph Smith saw God because he was not sinful (thus contradicting Romans 3:23; 1 John 1:8, and Smith’s own personal testimony in Joseph Smith 1:28). 2) He can insist that Joseph Smith saw God while arguing that the main point of Exodus 33:20 in the King James Version and every other version, including Smith’s “Inspired Version,” is inaccurate. 3) He can admit that the main point of Exodus 33:20 in the King James Version, and every other version, including Smith’s “Inspired Version,” is accurate and Smith was lying about his first vision experience thus confirming that his work was a fraud. I pick number three. I wonder which one Mr. Hinckley would choose. I would simply tell the LDS who claim, (We) will never disprove mormonism, it comes down to this. You either refuse to look at any evidence anyone provides and simply choose to assume we are lying, therefore willing believe whatever you want. Or you will look at all the evidence and then decide. I have meet many LDS that have looked at all the evidence, then decide LDS is a false gospel. But also many that believe it is true. You seem to think that if someone has once sinned, he is thereafter forever “sinful,” so to you, Romans 3:23, and 1 John 1:8 and JSH 1:28, all teach that having sinned, they can only be sinful. Fortunately, the true gospel of Jesus Christ teaches that the blood of Christ cleanseth us from all sin. Perhaps you think His blood isn’t powerful enough to remove the stain completely? Alma seems to assume that because an individual has had his sins pardoned that this somehow also removes that person’s sin nature. It does not. Even though a believer has been delivered from the reign of sin, his sinful nature still resides in him. Paul made this clear when he admitted to his carnality in Romans 7. He wrote that the “no good thing” that was in him was actually sin that “dwells within” (Romans 7:18,20). When writing the Church at Galatia he stated that the scripture concludes that all are under sin (Gal 3:22). Bear in mind that he is addressing a church. Are we to assume this church was full of unforgiven people? The word “flesh” in the KJV often speaks to the sinful nature we all have. (See Romans 8:3, 5; Galatians 5:16, 17, 24; I Peter 4:2; 2 Peter 2:10). Based on Alma’s assumption it would seem that Joseph Smith, while personally viewing the person of God the Father, could have rightly said at that time that he “had no sin.” Yet the Apostle John never qualifies his statement in 1 John 1:8 by saying we can correctly assume we have no sin just because we are forgiven. While it is true that Christians have no sin accounted against them, it is erroneous to assume we are not still sinful creatures dependent upon God’s daily mercies. When John wrote, “If we say that we have no sin, we deceive ourselves, and the truth is not in us” he was addressing the very issue Alma is supporting. John is clarifying in verse 8 what he said in verse 7. In other words, don’t think just because God no longer holds you accountable for your sin that this means that you have no sin. While forgiveness does change our standing with God, it does not change our nature. Alma states that I “seem to have missed the important words ‘at this time’ in the JST. Contrary to your assertion,” he writes, “Joseph Smith didn’t make the warning stronger, he indicated that it was a temporary con; for Moses had already spoken with God ‘face to face.’ The warning was that Moses and the people could not see His face ‘at this time.’” Actually, I think it is Alma who has missed some important words. In the last part of Smith’s alteration it reads: “neither shall there be any sinful man at ANY TIME, that shall see my face and live.” This clearly makes the warning perpetual and not temporal. As to Alma’s assumption that Moses saw God’s face. Think about this for a moment. Do we really think that the same Moses who allegedly saw God’s face would insist just a few passages later that this was not possible? What a short memory Moses must have had! At night before going to sleep I often speak “face to face” with my wife though I cannot recognize any of her facial features due to the dark. The solution to this miniscule quandary is found in Exodus 32:9 when it states that the Lord entered the tabernacle via a “cloudy pillar.” He spoke to Moses through this cloud just as he called out to Moses out of the midst of the burning bush in Exodus 3:4. 4) Joseph Smith did see God the Father face-to-face as did Jacob, who becomes Israel (Gen. 32:30), as did Moses (Exodus 33:11, Deut. 5:4, Deut. 34:10). Did you leave out these references on purpose to make yourself appear to have the answer to the supposed demise of the LDS Church? It’s ok to blog your opinions, but you should include all the facts. Not just those that attempt to prove your narrow mindedness. What about an Option 5, Joseph Smith Himself said, NO MAN CAN SEE THE FACE OF GOD AND LIVE, WITH OUT THE PRIESTHOOD. At the time of this so called Vision, Joseph Smith did not have the Priesthood, So this would make Joseph Smith a liar, So either he saw a vision, but like the Bible teaches, Satan can come in the form of an angel of light to decive. So Rick, how did Moses do it? It is apparent that both Moses and Joseph had it happen to them. Don’t be confused about the statement. Where does it say that the person seeing the face of God must hold the priesthood? He is merely stating that the power of the Priesthood is the protecting power by which man CAN look upon the face of God and live. So, where are we now? We have eliminated option 5. We have thereby eliminated option 2 (since at a minimum we know Joseph, Moses, and Jacob have seen God face-to-face). And since he saw God (as did Moses) that by default eliminates option 1. Since option 3 is the same as option 2 with a little different spin on it, that leaves option 4 as the only valid option (with biblical proof I might ad). You can say that it is impossible for man to look upon God and live, but if you stand by that statement then you are saying the bible is not completely true since it also states that at least two men saw him face to face. There is one thing I don’t understand though. Why is it so hard to believe that a man has seen God? Why is it that you think Joseph couldn’t possibly have seen God? Lack of faith? Jealous that it wasn’t you? You can say you know he didn’t, but I say I know he did. You should start by asking yourself, what if he did? 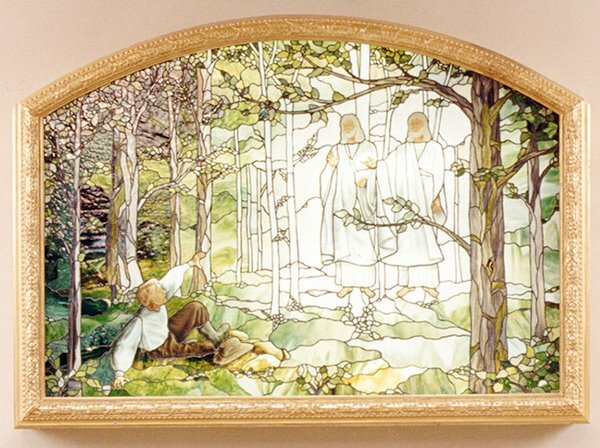 What if Joseph Smith did see God the Father and Jesus Christ that spring morning in the grove?